Christmas may be more than a month away, but the Wilkerson family of Holton is already ready. The Wilkersons are prepared for the holiday season for another reason, as they are one of five stops on the “I’ll Be Home for Christmas” homes tour scheduled for 10 a.m. to 3 p.m. Saturday, Dec. 6. 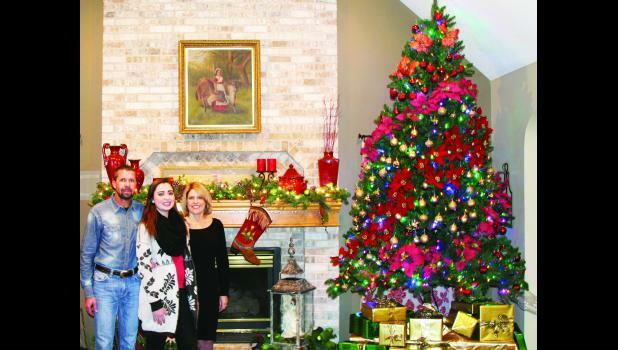 Rosemary and Les Wilkerson and their daughter, Rosalie, a senior at Holton High School, have decorated their home, top to bottom and inside out, as part of the tour. They have lived in their current home, which is located just north of Holton, for 17 years. A large nine-foot Christmas tree is the star of their formal living room and is decorated with poinsettias and various “bands” of colored ornaments. On the nearby fireplace, stockings made from cowboy boots rest. “Our home is normally decorated in a western style so the boot stockings fit right in,” Rosemary said. In the family’s dining room, a tree is decorated with white poinsettias, white lights and old-fashioned cookie cutters. Rosalie’s room is a nod to old Hollywood and Audrey Hepburn with pink Christmas trees with pink, purple and black decorations. “Rosalie also found a tutorial on Pinterest and cut out these really intricate snowflakes,” Rosemary said. The Wilkerson’s guest room is decorated in red, white and blue, in honor of the couple’s nephew who is stationed in Hawaii and a niece who attends The University of Kansas. Downstairs, the family’s traditional tree is decorated in red and gold and is adorned with grade school pictures of Rosalie. The Wilkersons host extended family at their home every Christmas Eve, serving soup and chili. On Christmas morning, the three Wilkersons open presents together, and Rosemary hides a special Christmas pickle ornament on a tree for Rosalie to find. The ornament was a present from Rosemary’s grandmother. Rosemary, who is a native of Holton, is the executive director of development at Benedictine College in Atchison, and Les, who was raised in Circleville, is the vice president of veterinary sales at Medicatech USA. Sponsored by the Holton/Jackson County Chamber of Commerce and in part by the Jackson County Tourism Council, the “I’ll Be Home for Christmas” homes tour include homes owned by the Wilkersons, Brooks and Tonya Barta, Phillip and Ginger Lloyd, Dennis and Joni White and Brady and Brooke Black. Five Chamber businesses – Koger Variety, expressions, Lee’s Flower & Gift Shop, Uptown Treasures, and Heart to Home LLC – will showcase holiday items at each of the five homes that will be available for purchase after the show. Tickets are $15 and can be purchased at Denison State Bank, Holton National Bank, Farmers State Bank and the Holton/Jackson County Chamber of Commerce. The tour is a fund-raiser for the Chamber, it was reported. For more information about the homes tour, call the Chamber office at 364-3963.